The Must-Play Magic Of PlayStation Move Involves... A Foam Finger? Don't snicker at Move Party. It is the game most squarely targeted at families among the motion-sensitive games showcased today at Sony's PlayStation Move event. It is the most magical game here. Ever see Who Framed Roger Rabbit or any other movie that has real-life people holding animated objects? That's what Move Party does, rendering cartoon objects in your hand. 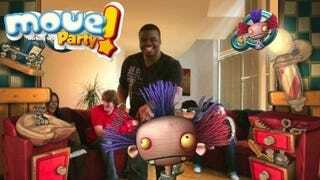 When I was swatting bugs in Move Party, I didn't appear to be holding a PlayStation Move controller. On the TV, it appeared that I was holding a cartoon tennis racket. It was like I was looking into a mirror with a sense of humor. When I had to pop balloons, I appeared, on the TV screen, to be holding a spiky prod. Understand that I was seeing myself, projected in there. I just wasn't holding a Move controller in the TV version of my reality. When I was painting, I seemed to be holding a paintbrush. I was competing in the kind of mini-games that I feel like I played in EyeToy games on the PlayStation 2, but I didn't care. I had something that seemed magical in my hands. The best experience I had with Motion Party occured outside the mini-game competitions. During one of the set-up screens I was projected onto the TV, my Move wand rendered as a stick with a big foam hand. The hand had a wobble programmed into it, so, as I shook my hand it wobbled on the screen — just as you would expect a real foam hand to. The foam finger bit included an interesting feedback loop. When I waved my hand (and the Move) in order to make the foam finger wobble, the Move controller vibrated, in sync with the extremes of my waving motion. Just as you'd feel some resistance in your hand if you shook a long, wobbly object, I felt a little vibrational pushback from that unreal hand. I was feeling something that wasn't there. It felt magical. Move Party is going to be sold as a family game, a fun-for-all-ages motion gaming experience. But it should not be ignored as a splendid technological magic trick. Most of what Sony showed at today's Move event recreated or reinterpreted experiences that have already been executed on the Wii. Move Party went beyond that. It is the special twist that teases some of Move's best potential.